I wish you all a Happy New Year and trust that everyone saw in the New Year with friends and family. 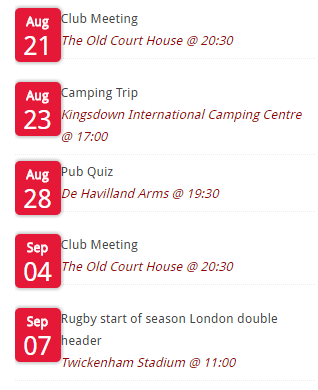 There are six months left of the Rotaract year and if they are anything like the last six months, we will all be very busy. Most of Rotaract will be either at the New Year’s Eve holiday near Burnham on Sea or on their way home when this bulletin is published. Thirteen past and present members will be attending the holiday, but my ability to see into the future is on the fritz so you’ll have to wait until next month for a description of what we all got up to. December started with the Rotaract Christmas party at the Village hotel in Farnborough where we had lots of food, drink and dancing. A good night was had by all and thanks to Sarah H for organising. Rotaract also put on its annual Reindeer Racing at Williams Hitchcock House. 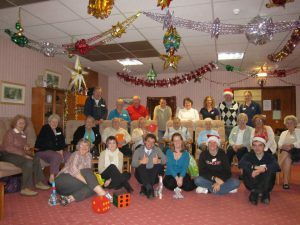 This event is always popular one with those of us in Rotaract and the residents of William Hitchcock House have a good time to with their sherry and mince pies. Also this month, we had our Secret Santa at the last club meeting of the year and the theme is “Charity shop”; I look forward to seeing what bargains everyone will have found. 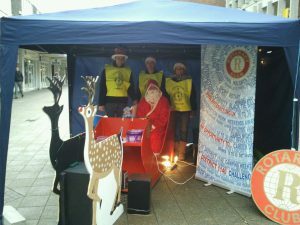 Camberley Rotaract assisted Rotary this month with a day of Christmas collecting in Camberley town centre. I got to dress as Father Christmas for two hours on that cold Sunday morning while fellow Rotaractors collected the money from the busy shoppers. After my shift was over, other Rotaractors took over until the shops closed and although we had to compete with the French Christmas market that was also on that day, we all collected a healthy amount. Rotaract would also like to thank Rotary for inviting us to your Christmas Dinner, I know that we all very much enjoyed the evening, especially the magical entertainment after dinner. I shall leave you now with an outline of what we have planned for the coming month, a speaker night with a representative from SURSAR (Surrey Search and Rescue) in place of a pub night, a wine tasting evening at Majestic Wine, a trip to the planetarium in Winchester, the usual meetings and a pub night.